Start with this list. Focus on the essentials. My last semester of college was during the fall months, and for the first time, I was living on my own, and not in a college dorm and not with my parents. No roommates, either, though that singular, private living situation wouldn’t last too long. This apartment was a few miles off campus, past the entrance to the interstate highway, where rents were much cheaper. That’s exactly what I needed. My last responsibilities at college were student-teaching and preparing for my senior recital, the capstones to my music education degree. So I was still a student — a student without a job for at least a few months, without money being earned, and I don’t even remember how I was able to afford my rent. The living situation was a big change from the dorm rooms in the preceding years. Everything is provided in the dorms — paid for along with tuition, naturally, but students never had to worry about outfitting rooms with basic furniture. At least a bed and a desk. Somehow, I owned a bed and mattress. I have no memory of where they came from. And that’s the only furniture I had in this apartment. Well, besides the bed, I had a television on the floor in the living room. I didn’t even have blinds or curtains on the patio door. If it didn’t come with the apartment, I didn’t have it. And nothing came with the apartment. As a result, the place wasn’t exactly ideal for entertaining guests. I had no visitors so I wasn’t too concerned about the state of my domicile. All I needed to be able to do was sleep — which I did — and practice — which I sometimes did. Maybe I had a lamp. 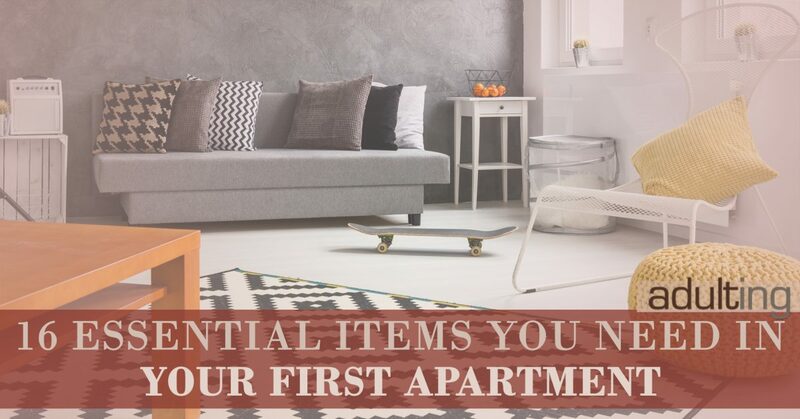 What would have been helpful to me is a guide that explains exactly what you need or should have in your first apartment, whether you have roommates or not. Here is that guide. I’ve listed what you need, ranked in order of importance, by room. Many of the furniture items can be found on a budget. Always check second-hand stores or Craigslist. You need these items for your bedroom. 1. Mattress. This is the most basic item. You need to be able to sleep relatively comfortably. A mattress will do the trick. If you’re on a budget, air mattresses can be quite comfortable these days, and much less expensive than a fancier typical mattress. A step up might be a futon. Unlike just about everything else, I would not buy this item on Craigslist or used at a thrift store. 2. Lamp. Shine some light in the bedroom. You’ll be thankful for illumination, especially in the winter when the sun sets early. 3. Alarm clock. Well, you probably have one on your smartphone. You may be living in your own for the first time and not sure how you’re going to pay rent, but I’m sure you’re managing your phone just fine. But having a real alarm clock as a back-up has saved me many times. 4. Window curtains. The one place where you don’t want neighbors peeking in is your bedroom. Maybe your place comes with blinds, and if so, curtains are further down on the list, but still good to have. 5. A bed. If you want to prop your mattress up a little higher than floor-level, you’ll need a bed. I lived in one apartment without a bed, though, so it is possible to get by without one. You cannot have a bathroom without these. 1. Toiletries. Expect to brush your teeth every day. Grab all the basics including toilet paper, mouthwash, toothbrushes and toothpaste, soap, shampoo, shaving items, and a first-aid kit or at least adhesive bandages (Band-Aids). 2. Towels. Drip-drying takes far too long. You can get by with one, but two would be better. Feeling fancy? Get one of those towel hooks that fit over the bathroom door. 3. A shower curtain. Most apartments won’t come with one. Shower curtains can be inexpensive, and they give you privacy and added safety in the bathroom. You may need to buy curtain rings separately. You may even need to get your own curtain rod. 4. A plunger and toilet brush. One is for cleanliness and the other is to prevent a big mess. Let’s go into the kitchen. Who’s cooking? 1. Dishware and silverware. No need to get fancy here. My first set was inherited from a friend. A few plates, a few bowls, forks, spoons, butter knives, and if you’re ready, a sharp knife set. 2. Pots, pans, a spatula, a ladle, a slotted spoon, a regular spoon, oven mitts, and a can opener. Unless you plan to order in every day and every night, you’ll be cooking. No need to get anything fancy here unless you really love spending time in the kitchen. Just the basics will suffice. 3. Dish soap, napkins, and paper towels. And if you have a dishwasher, dishwashing detergent. 4. Trash can. You need at least one in your apartment, and if you do have only one, it should go in the kitchen. Not everyone has a living room, but here’s what you would need. 1. Something to sit in. In my first apartment, this was the floor. Somehow I managed, but it wasn’t ideal. You can find at least a cheap chair. I eventually upgraded — in my third apartment — to a cheap sofa from IKEA. 2. Curtains or blinds for the windows or patio/balcony door. Again, privacy is the main concern here, and some type of covering might be required by your lease. 3. A television stand or mount. These days, fancier people are mounting televisions on walls. In my first apartment, I got by with leaving the TV on the floor. 4. A coffee table. Again, I didn’t have one until later in my adult life, but this is a basic piece of furniture that separates the barely-adults from the mostly-adults. Beyond these items, everything else could be considered a luxury. Chances are good that you won’t be in this apartment for a long time. You can upgrade and add items one at a time. Living in comfort is a process, and when you first move out on your own, there’s no expectation that you have the best-decorated and best-outfitted apartment among your friends. 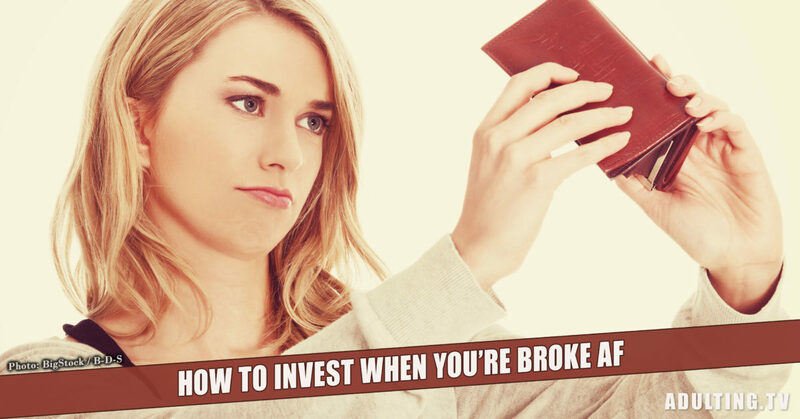 Save the money now. 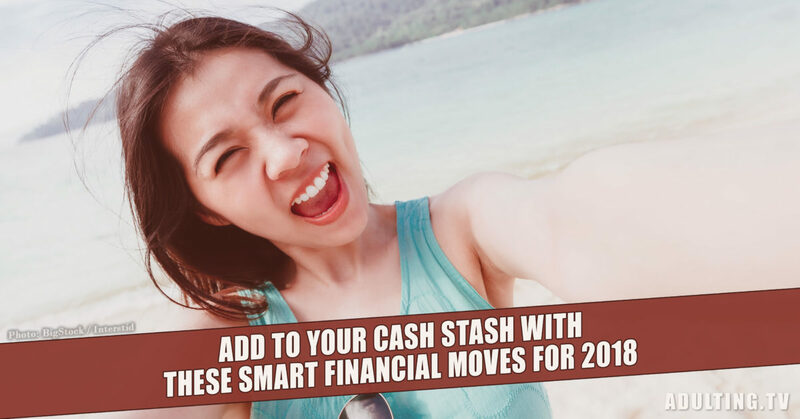 Take care of your necessities and put away any cash you have left over. You can take your time and ignore the pressure to have everything in your life and your living environment together immediately.